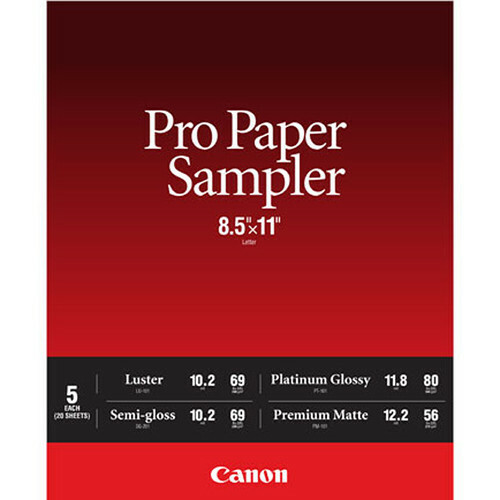 Determine which high-quality paper is right for your next project with this 8.5 x 11" Pro Sampler Pack from Canon. It bundles together five sheets of each paper type, including Luster, Semi-Gloss, Platinum Glossy, and Premium Matte. This range includes a variety of different surfaces to ensure you have the right tools for the right job. Box Dimensions (LxWxH) 11.7 x 9.1 x 0.75"
Pro Paper Sampler Pack (8.5 x 11") is rated 4.9 out of 5 by 14. Rated 5 out of 5 by Gerald R. from A Good Resource After installing the new Canon Pro-1000 these papers were a great help in testing the new printer and learning about the paper characteristics. Rated 4 out of 5 by David from Handy Way To Judge Various Papers Canon makes some excellent papers and the only way to truly find your favorites is to print some test prints. I was torn between Semi-Gloss and Luster as my Canon favorites and decided on Luster. Of course, I did the same thing with other brands. My only criticism is that the watermarks on the back of the samples does no identify which paper it is. Some papers have very small differences in physical appearance; therefore, I wrote on the back of each test sheet to avoid confusion in the later comparisons. Rated 5 out of 5 by Michael from GREAT Paper!!! Sample Pack is great. My favorite is The Luster Pro. I photograph Musicians and they just love the brilliance that it produces. Rated 5 out of 5 by Rocketman314 from Great way to try Canon papers If you just bought a Canon printer or any photo printer, this is a must buy. It's a great way to try out the Canon line of photo papers before committing to an entire pack. Rated 5 out of 5 by Cb2 from Awesome Pack! This pack was awesome because I print for a variety of different media. Quality was great. Rated 5 out of 5 by Notloc from Great! Really helped me decide which paper to print my work on without buying full packs of each. Rated 5 out of 5 by John from It took off running great color right out of box! Color prints that pop! It was pretty easy to set up. Color seems to be accurate. Ihave printed 2 13x19 and half a dozen 8.5 x 11. Minimal ink level drop on starter cartridges. I wish it had an option for 8x12 paper what a beast! I plan on using it fulltime in RV. Rated 5 out of 5 by Dale from Nice sample pack Nice sample pack with 5 pages of each type of paper, which allows for some test prints to adjust brightness before final print. High quality papers, with better print quality on luster for the same print and settings than the Epson luster paper.